Municipal workers in Woodstock, members of CUPE 1146, have organized to ensure city staff do the work at a newly-built solid waste depot. CUPE members in the public works department created a “sea of orange” as CUPE 1146 President Denis LeChasseur urged council to keep the new jobs public at a December 14 city council meeting. At that meeting, council voted to put off a final decision on contracting out the depot jobs. In early January, council voted to bring the new work in house, hiring four full-time public works employees. The depot will handle bulky items as well the safe disposal of oil, tires, electronics and other household hazardous waste. Council had been considering contracting out the work. 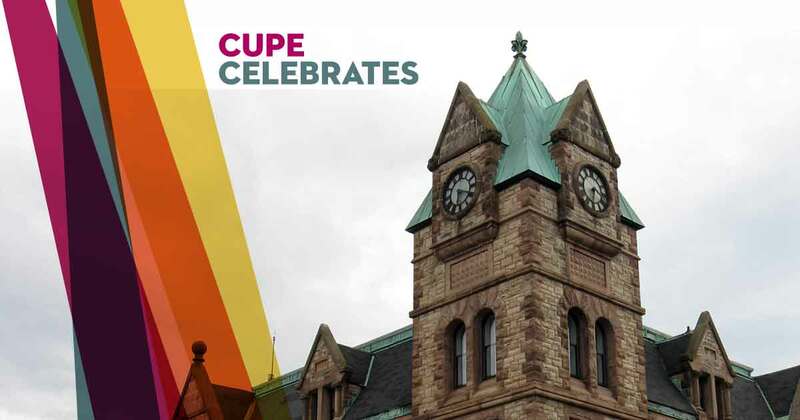 LeChasseur presented a CUPE research brief that highlighted serious flaws in the contracting process and warned of the dangers of privatizing this core city function. “We didn’t take it for granted that the decision was final. That’s our big lesson for other CUPE locals. Show up. Ask questions. You might be surprised what answers you get,” says LeChasseur. The city had not calculated the cost of operating the depot itself. The purchasing process lacked transparency and appeared to give preferential treatment to one company. It also appeared the company was the only one to submit a bid. The city’s bylaws forbid sole-sourcing of contracts. “It’s a publicly built facility for the community, built with public funds. We want our municipality running the facility and taking responsibility for waste disposal,” says LeChasseur. CUPE’s brief emphasizes the importance of the city operating the recycling facility itself. The benefits of public operation include more waste being kept out of landfills and properly processed, better transparency and oversight, and greater flexibility to adapt to new provincial solid waste legislation. Ontario’s Circular Economy Act will make companies pay to safely dispose of materials they produce. Under the system, which will be gradually implemented over the next five years, municipalities will spend less to collect and process solid waste. Public operation will allow the City of Woodstock to have the flexibility to adapt to these changes, keep control of any new revenue that’s generated, and ensure the depot’s bottom line is focused on diverting and processing waste – not private profit. “When it’s your community and you’re the workers processing the waste, it’s a lot closer to home literally and figuratively. People tend to be more accountable. The service is not money-driven. The priorities become different, when it’s not just about making money, it’s about environmental conscience,” says LeChasseur. CUPE has documented the many benefits of public solid waste services, including in the 2016 Columbia Institute report Back In House. The report profiles four Canadian municipalities that ended private, for-profit solid waste contracts. The depot is expected to open in the spring of 2018.